Now featuring a sneak peek at Christina's forthcoming novel A Piece of the World, coming February 2017. Christina Baker Kline’s #1 New York Times bestselling novel—the captivating story of a 91-year-old woman with a hidden past as an orphan-train rider and the teenage girl whose own troubled adolescence leads her to seek answers to long-buried questions…now with an extended scene that addresses the number one question readers ask, and an excerpt from Kline’s upcoming novel A Piece of the World. Seventeen-year-old Molly Ayer knows that a community service position helping an elderly woman clean out her home is the only thing keeping her out of juvenile hall. But as Molly helps Vivian sort through her keepsakes and possessions, she discovers that she and Vivian aren't as different as they appear. A Penobscot Indian who has spent her youth in and out of foster homes, Molly is also an outsider being raised by strangers, and she, too, has unanswered questions about the past. 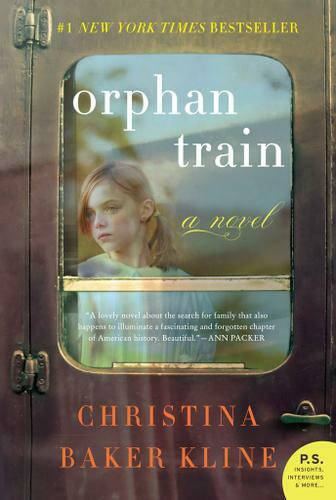 Moving between contemporary Maine and Depression-era Minnesota, Orphan Train is a powerful novel of upheaval and resilience, of second chances, and unexpected friendship.